The Oakland Athletics schedule for 2019 includes games from April through September. Each month, they play almost a dozen baseball games at home. It's always fun watching the A's play at the Oakland Coliseum, just across the bay from San Francisco. Each year, they host other American League teams such as the Boston Red Sox, the New York Yankees, and the Los Angeles Angels. Are you ready to see them in action? Read on for everything you need to know about attending a home game in Oakland! Going to a game is fun, but it's even more fun when you can pick up your tickets at a discount! You will find tickets at up to 50% off on Goldstar. The seats they typically offer are in the upper rows, but it's a great way to save on a game. Click here to find tickets at up to 50% off on Goldstar. It's easy to get to the Oakland Coliseum using BART, the Bay Area Rapid Transit system, which is the local train that runs below ground in San Francisco, through a long tunnel to the East Bay, and above ground in surrounding cities. Taking BART is the cheapest and easiest way to get here since traffic can be terrible around the stadium and parking is expensive. Three BART lines stop at the Oakland Coliseum (just across the street from the stadium). The colors mentioned below next to the routes indicate the color of the line on the BART map. At the station, the signs for the trains are not color coded, so double-check the name of your train's destination when you board to ensure you are on the right one. San Francisco/Daly City to Fremont (Green Line): This line will take you directly from downtown San Francisco to the Oakland Coliseum stop. San Francisco to Dublin/Pleasanton (Blue Line): This line also takes you from downtown San Francisco directly to the Oakland Coliseum stop. Richmond to Fremont (Orange Line): This line runs only in the East Bay. It runs from the town of Richmond (north of Oakland) to Fremont (south of Oakland). This is the train you would look for when coming to the game from Berkeley, Oakland, or Fremont. You can pick up your tickets to the train at any station. Each station will tell you the exact amount to get from that station to the Oakland Coliseum. I recommend purchasing a round-trip ticket because the lines to get tickets are long after the games, and if you have enough credit on your card, you can skip that step and just board the train to go back. 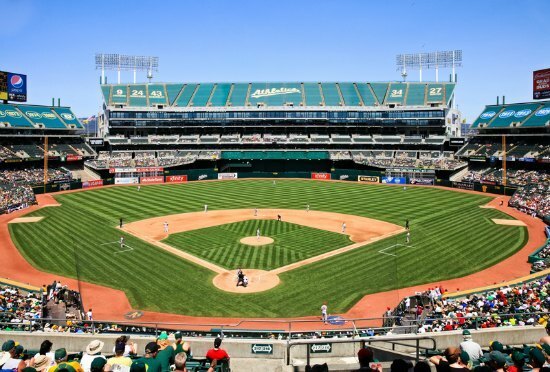 If the Oakland Athletics schedule offers you a chance to catch a game during your visit to the SF Bay Area, it is worth the trip across the bay to see them play. You will have an amazing time. Here are a few more game day tips. The weather over in Oakland is a little warmer than in San Francisco. However, I still recommend that you come prepared for cooler temperatures after the sun goes down. At night, the temperature will dip down into the 50s, especially in April and May. The warmest evenings are in August and September, when the temperatures are in the upper 50s. You will find a wide variety of food options within the park. You can watch the game with a traditional hot dog and beer, or pick up some sliders and nachos. Some of my favorite places to grab food in the stadium are The Q Barbeque (Section 137) and Sliders (Section 23). You will find several maps of all the places to eat once you step into the ballpark. During Sunday home games, all kids 14 and under are invited onto the field to run the bases. The A's mascot, Stomper, will be there to cheer them on! The Oakland Athletics came to the Bay Area in 1968. The team started in Philadelphia (1901-1954), moved to Kansas City (1955-1967), and then made their way to Oakland. They are currently in the American League's West Division. Since their arrival in 1968, they have brought home four World Series Championships. They won in 1972, 1973, 1974, and 1989. They also have 16 West Division Titles. The Athletics' win in the 1989 World Series was against local rival SF Giants, and was one of the most memorable moments in Bay Area history. Just a few minutes before Game 3 started, a strong 6.9 earthquake shook the area, becoming the first major earthquake in the US to be broadcast live on television. Hence, the Loma Prieta Earthquake is also known as the World Series Earthquake. 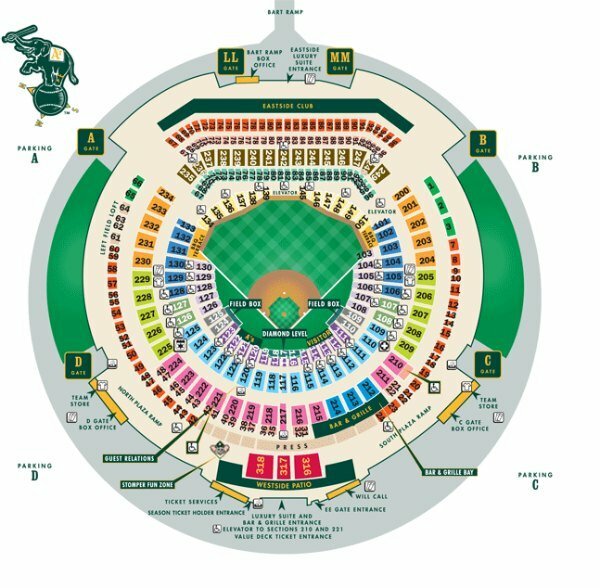 If you love ballparks, then check out the tour offered at the Oakland Coliseum. This tour takes you to several places within the stadium that are not usually open to the public. You will visit the Press Box, Owner's Suite, Press Conference Room, Dugouts, and Visitor's Clubhouse. Don't forget your camera! The tours run on certain non-game days from April to the end of July. Only 15 people are allowed on each tour, which lasts for about an hour and a half. Click here to find the dates for this tour and to book your tickets today.